Make sure that your company stands out with a professional and stylish printed letterhead. Our products will give you confidence in your brand identity and help you to connect with customers and contacts. 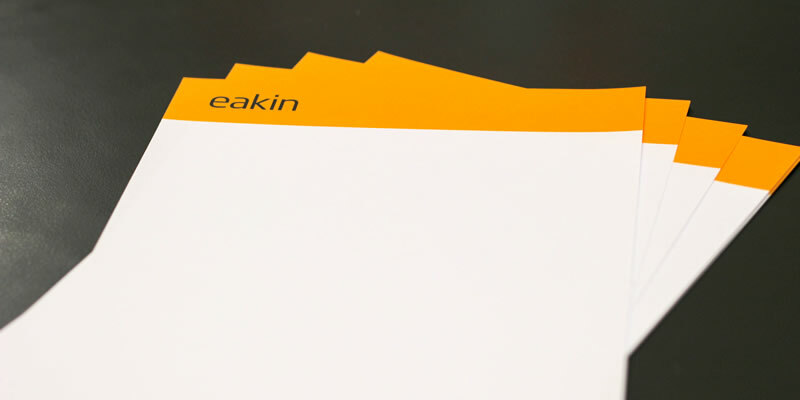 At Eakin Ltd we always seek to provide the highest quality in both printing and paper, straight from our printing presses in Northern Ireland. With our printed letterheads and business stationery you'll get premium quality paper and bold vibrant colours. Don't worry if you don't have a design. We have a brilliant in-house team of innovative and creative graphic designers who can bring all of your ideas to life. They will work with you through the process to ensure the finished product meets your requirements. Our letterheads are part of our business stationery range that includes the printing of business cards, notepads, desk pads, compliments slips, calendars and presentation folders. When ordering your branded letterheads why not consider some other products from this range with matching branding to really make your company look the part. Complement your printed letterheads and stationery range with our NCR Docket Books.